Most drivers are aware of basic safety rules like wearing seatbelts, checking your brakes and maintaining a good stopping distance. If it’s been a while since you sat your driving test, refreshing your knowledge of the Highway Code can be very useful. In this article we will focus on some of the lesser-known driving safety tips to keep you safe in your car. If you’re tired or plan to drive during your usual sleeping hours, drink 2-3 cups of coffee before you leave. American research (1995) showed that this is the amount you’d need to improve your alertness. Caffeine stays in our systems for 6-8 hours. It can be difficult to judge the correct driving distance at high speeds. To check you’re far enough from the car in front on a motorway, count “one second – two seconds” from the moment the car in front passes a tree or call-box. You shouldn’t pass it before two seconds. If you’re towing a caravan or trailer, you must not exceed 60mph on the motorway. Don’t drive too close to cyclists – they may need to move out to avoid a drain or ditch, or turn right at a junction. At night, dip your headlights when you see a cyclist so that their vision is not impaired. All children younger than 12 must legally use a child seat or special seatbelt. Check that yours are using the appropriate type of seat (read more in our child safety section). In fog: Drive slowly – don’t speed up until you are sure the fog risk has gone. Use dipped lights and fog-lights in severe fog. In snow or ice: Tune in to local stations to see whether you should make the journey. Take warm clothes, a windscreen scraper and – in really bad conditions – a shovel. Put anti-freeze in the radiator and washer bottles, and check your battery. Ice can mean it takes you ten times longer to brake, so leave longer stopping distances. 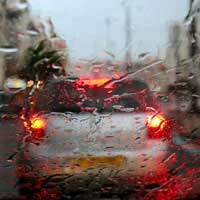 In heavy rain or flood: Allow extra stopping distance, and use dipped headlights. Drive slowly through flooded areas and, when you come through them, test your brakes. Using a dog guard, cage, or seatbelt. Dogs in the boot should be protected by a dog guard, which prevents them from being flung forwards in an accident. A cage does the same job. If your dog travels on the back seat, you can use a special dog seatbelt! These attach to the regular seatbelt and harness the dog safely and comfortably. Using a pet carrier for small pets. Make sure you choose one that’s big enough for your pet to fit inside comfortably, but not too big to outsize the seat in the car. Put in into the car, either strapping it in with a seatbelt, or pushing it down into a footwell. Introducing your pet to his or her carrier early helps make the difference, but if your pet is unhappy you can also try putting one of your jumpers inside the carrier for comfort. For puppies, you can also buy absorbent pads in case of in-car accidents!